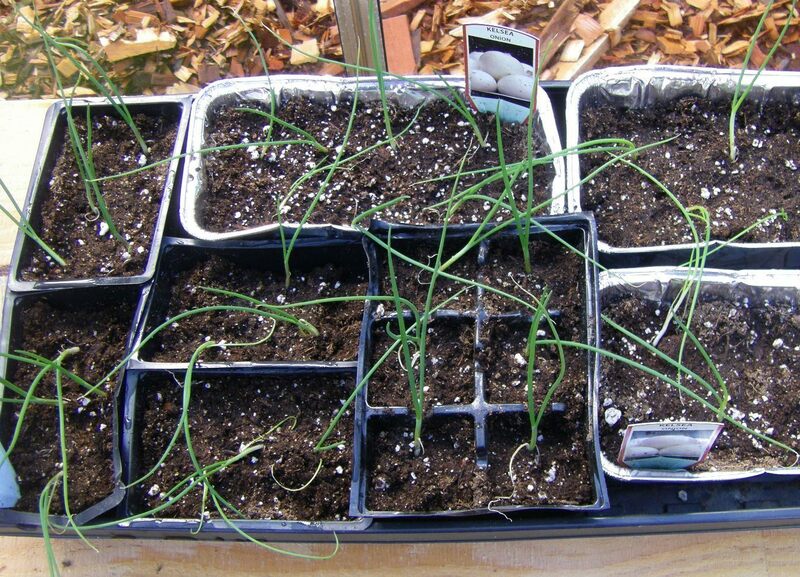 There are many ways to plant onion transplants in a raised garden or any garden for that matter. Below is the method that I’m using this year to create a wonderful harvest for the fall. I got my transplant a couple of weeks ago but didn’t have the soil prepared yet to plant them. 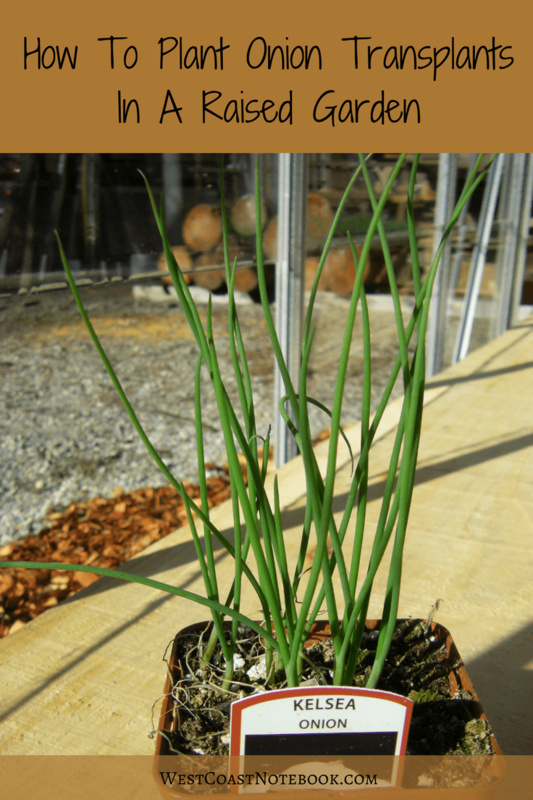 My favourite is Kelsea onions as they grow really well on the west coast and are good keepers. They take approximately 110 days to harvest and you space them 8″ apart. 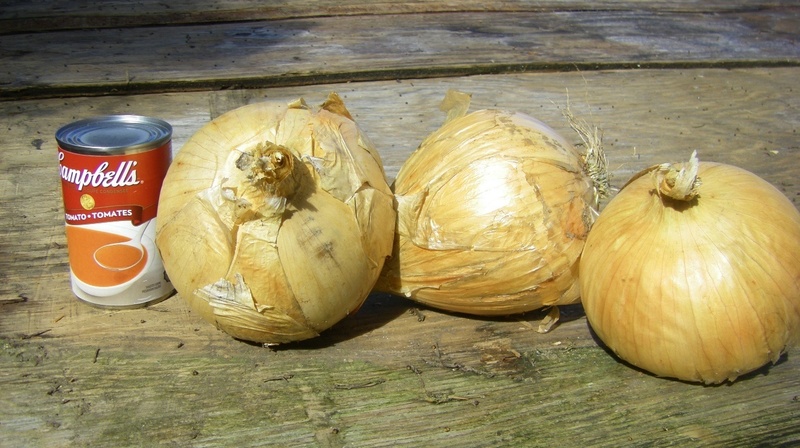 As you can see from the picture below the onions are still firm with a papery skin and I put in the soup can so you could get a sense of how big they are. Onions kept over the winter from last year’s harvest. They are still good, solid and juicy in April. Instead of leaving the transplants in the pot they came in, I took them out of the pot, shook off the roots, teased the onion roots apart and planted them individually into their own pots or in larger trays and put them into the greenhouse until I was ready to plant them directly into the garden. After a 2 or 3 weeks in the greenhouse, I finally got a bed ready to plant them outdoors. You can read about how I prepared the bed in my last post. I alternated the rows as you can see in the diagram below. 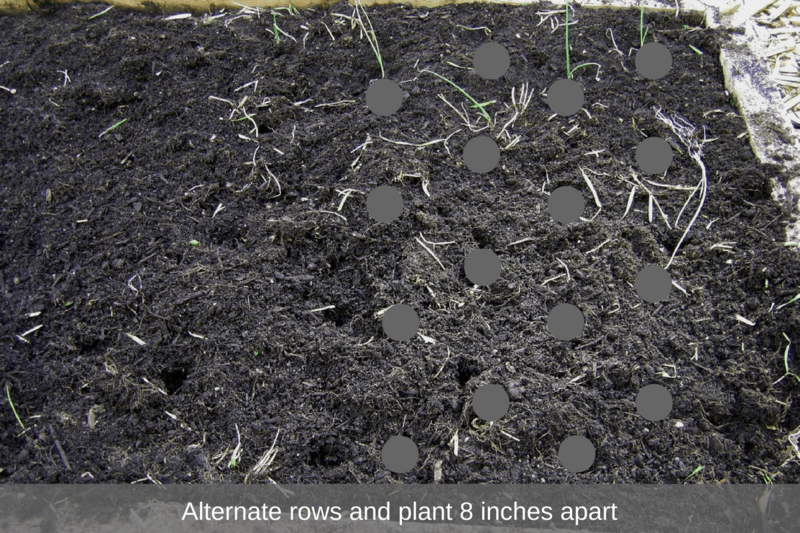 I put markers so you could see where I stuck my finger into the soil at the spot I was going to plant them. All I did was have a stick that was 8″ long and used that as a rough measuring tape. 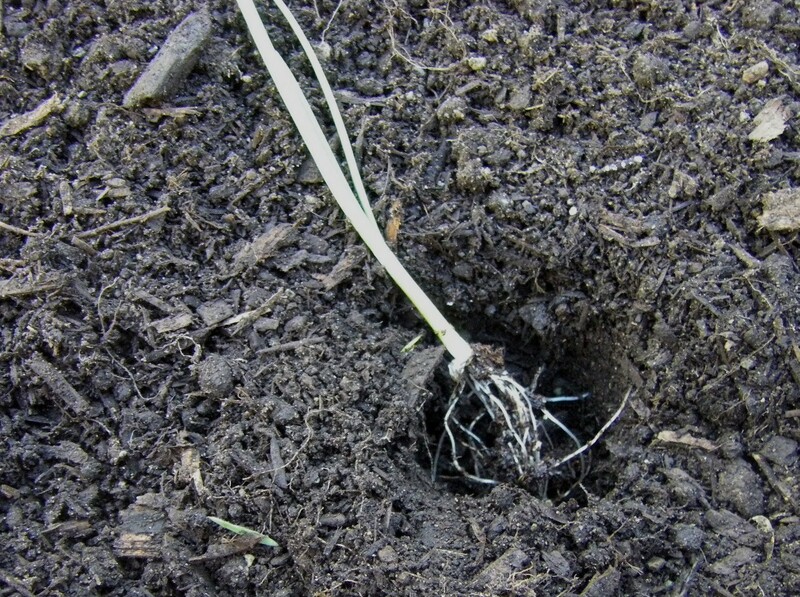 I then took the onions out of the pots and planted each one in its own hole. You can see how long the roots are, so I just stuff them in and press down the soil around them. The onions filled up 3/4 of the bed so in the last three rows I planted some seed tape that I had left over from last year. There were radishes and lettuce tapes and then I planted some seeds of fast growing lettuce that you can just cut as they grow. Sort of like mowing the lawn as they come back again and you can do it all over. 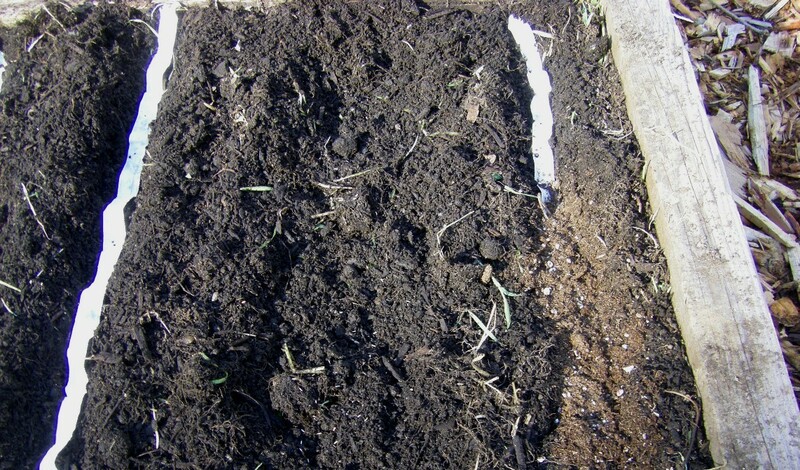 I just covered the seed tape with potting soil that I had around from planting seeds and watered everything thoroughly. 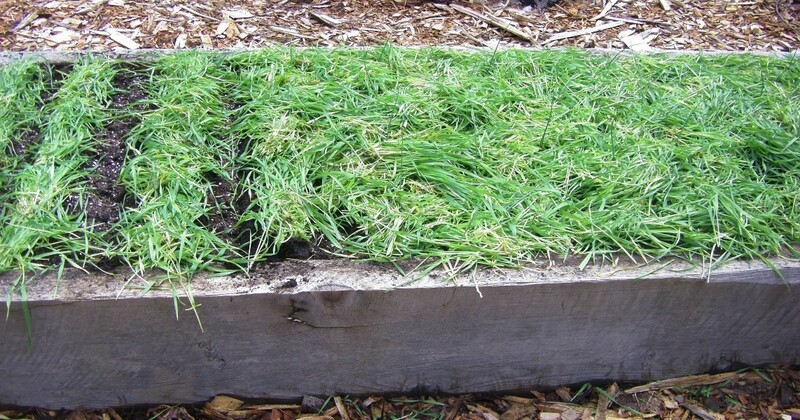 Once that was done, I took the clipping that I had gotten when I cut down my winter rye to use as a mulch for the onions and seeds that I had planted. 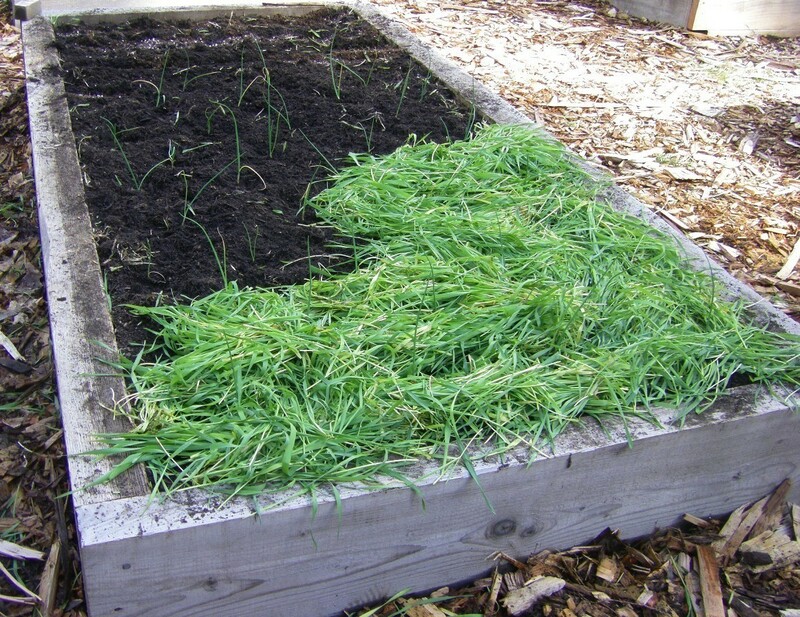 Onions love water, so I want to keep the soil as moist as possible. The poor onions almost get lost in the mulch, but I assure you I took great care to make sure none of them was suffocated. This mulch should break down in the next few months and once that starts to happen I will probably add some compost on the top to continue feeding the onions. Here is the finished bed after I completed mulching and watering. It should be relatively hands off other than watering it and harvesting at the end of the growing season.